The most immediately striking feature of this manuscript is its condition: it is from a library, subsequently incorporated into the British Library, which was damaged by fire in 1731. In the library catalogue published in 1802 is it described as '... once valuable and elegant ... [now] so much damaged as to be useless'. Careful 19th-century restoration work, however, made the volume usable again. The textual contents show that it was written for St. Kenelm's Abbey, Winchcombe, north-east of Gloucester and Cheltenham. In addition to chronicles and annals, the manuscript contains treatises relating to time-keeping and the calculation of dates, notably by the Venerable Bede. 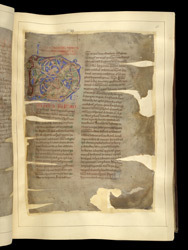 This page contains the prologue to one of these treatises, introduced by a foliate initial (incorporating an animal head and a horned human head), in a style typical of Winchcombe.